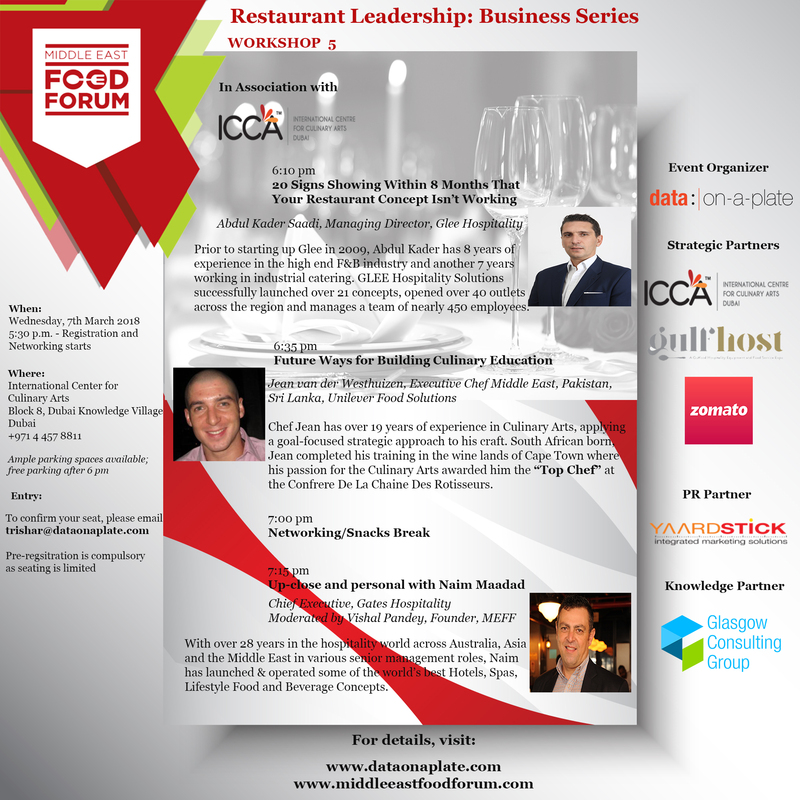 The Middle East Food Forum (MEFF) invites you to the 5th Workshop of the Restaurant Leadership: Business Series. The MEFF is the essential meeting place for food service business owners & operators, to engage with industry experts, address concerns and find new ideas & inspiration. The learning and networking event is the first of its kind focused on the restaurant industry. Prior to starting up Glee in 2009, Abdul Kader has 8 years of experience in the high end F&B industry and another 7 years working in industrial catering. GLEE Hospitality Solutions successfully launched over 21 concepts, opened over 4o outlets across the region and manages a team of nearly 450 employees. Chef Jean has over 19 years of experience in Culinary Arts, applying a goal-focused strategic approach to his craft. South African born Jean completed his training in the wine lands of Cape Town where his passion for the Culinary Arts awarded him the “Top Chef’ at the Confrere De La Chaine Des Rotisseurs. With over 28 years in the hospitality world across Australia, Asia and the Middle East in various senior management roles, Naim has launched & operated some of the world’s best Hotels, Spas, Lifestyle Food and Beverage Concepts. Entry: To confirm your seat please email at trishar@dataonaplate.com or call at +971 4 457 8811. Pre-registration is compulsory as seating is limited. Venue: International Center for Culinary Arts, Block 8, Dubai Knowledge Village, Dubai. Ample parking spaces available; free parking after 6 pm.